As she stood there looking at the bunch of medals that she won over the last four years, her eyes twinkled with a sense of achievement. A Std VI student from the Salempur-Pataura Primary School in Kakori, Lucknow, Archana has become an inspiration for children not just in her village, but also in neighboring villages. Ask her about the most memorable incident in her life and she points at the larger of the two trophies that adorn the small display cabinet in her house, alongside all the medals. Archana’s tryst with track-and-field began when she was in Std III in Village Panchayat Primary School in Ramnagar, Lucknow. It was Abdul Rauf — ‘Rauf Sir’ for her and the family — who introduced her to the world of athletics. Today, she studies in a different school, and yet, the guru-shishya bond between Rauf Sir and Archana is as strong as ever. In 2016, she participated in four events: long jump, and 100m, 200m, and 400m sprint, and bagged Gold in each of them. Rauf Sir’s contribution to her life has been inspiring and motivating for her. His knowledge about sports in general and athletics in particular, despite him not being a Physical education (PE) teacher, is commendable. He is full of praises for Archana. “We identified her talent in Std III itself and decided to groom her at the young age,” he said. All along, Rauf Sir and other teachers continued to support her; they built a sand pit for her to practice long jump; they helped her with the route, and even ensured that she doesn’t miss out on academics because of her practice. Over the year, the investment by Archana’s teachers yielded rich dividends. Talking about Akshaya Patra’s meals served at school, Archana says, “When I am training, I need to eat a lot of nutritious food. So I am happy that we get it in our school.” It is therefore not surprising that she looks forward to Akshaya Patra’s food every day. Her favorite is Dal Chawal. 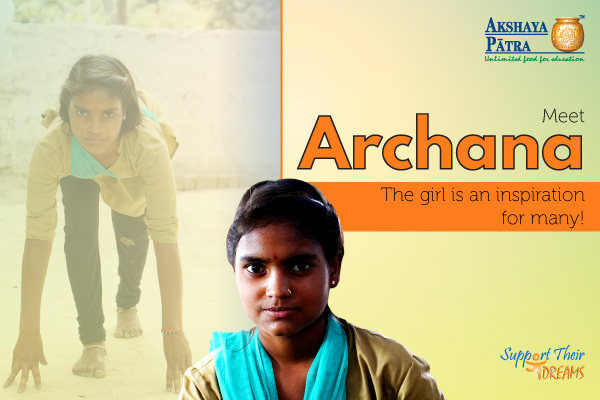 Archana wants to join the police force and serve the nation. She believes that her sports background will help her achieve this dream, especially because the selection procedure involves a physical exam that she intends to excel. As for her mother, she wants Archana and Nitesh to excel in both - academics and sports, and have a bright future. “If her father was there,” she said, “he would have been very happy. In fact, he would have done much more to see Archana succeed.” At Archana’s primary school, sports meet is held every month. The purpose is to inculcate the competitive spirit in children at a young age. Even today, Archana attends these monthly sports meets that made her the athlete she is. The only thing that has changed is that now she serves as an inspiration for all the children in school. The girl, who looks at PT Usha as her sports idol, now serves as an inspiration for others. Everyone wants to become like Archana didi.